Emperor Babur said, "On the East, the South, and the West it is bounded by the Great Ocean. "Hind was notably adapted in the Arabic language as the definitive form Al-Hind (الهند) for India, e.g. in the 11th century Tarikh Al-Hind ('History of India'). 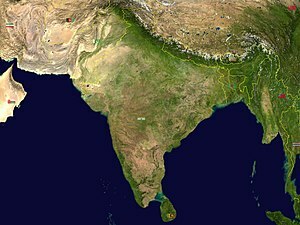 It occurs intermittently in usage within India, such as in the phrase Jai Hind (Hindi: जय हिन्द) or in Hind Mahāsāgar (हिन्द महासागर), the Standard Hindi name for the Indian Ocean, but otherwise is deemed archaic. ^ Panayotou, A. (2007), "Ionic and Attic", in A.-F. Christidis (ed. ), A History of Ancient Greek: From the Beginnings to Late Antiquity, Cambridge University Press, p. 410, ISBN 978-0-521-83307-3 : "The early loss of aspiration is mainly a characteristic of Asia Minor (and also of the Aeolic and Doric of Asia Minor)...In Attica, however (and in some cases in Euboea, its colonies, and in the Ionic-speaking islands of the Aegean), the aspiration survived until later... During the second half of the fifth century BC, however, orthographic variation perhaps indicates that 'a change in the phonetic quality of [h] was taking place' too." ^ Arora, Udai Prakash (2005), "Ideas of India in Ancient Greek Literature", in Irfan Habib (ed. ), India — Studies in the History of an Idea, Munshiram Manoharlal Publishers, p. 47, ISBN 978-81-215-1152-0 : "The term 'Indians' was used by Herodotus as a collective name for all the peoples living east of Persia. This was also a significant development over Hekataios, who had used this term in a strict sense for the groups dwelling in Sindh only."